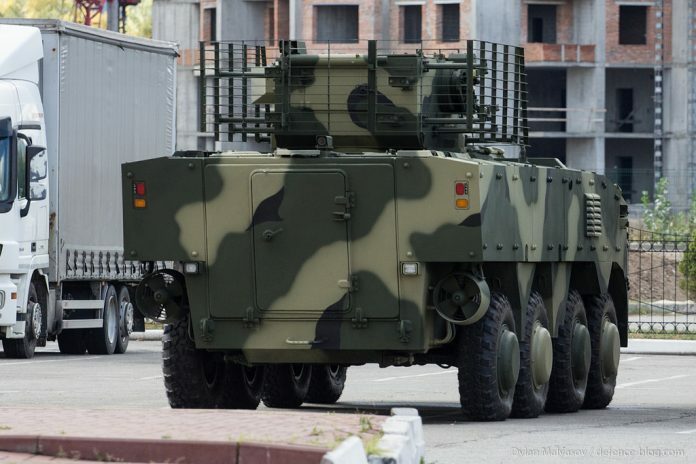 Kharkiv Morozov Machine-Building Design Bureau SE, which is part of the UkrOboronProm concern, is progressing with developing a new version of the BTR-4 armored personnel carriers. During the international exhibition “Arms and Security 2017” in Kyiv in October has presented the new version of the BTR-4 armored personnel carrier. The new vehicle is called the BTR-4MV1 and offers significant improvements over the standard BTR-4 armored personnel carrier. Major improvements include the new level of protection and engineering solution as a changes in the front of the armored vehicle and new armor kits to enhance survivability. The BTR-4MV1 wheeled armoured fighting vehicle offers significant improvements over the BTR-4 series. An advanced modular armour protection system provides the vehicle with NATO STANAG-standard from bullets, guns, and weapons. When creating BTR-4MB1, developers used a modular approach to building armor protection, using the spaced armor. Such a modular approach allows to quickly replace the elements of the outer layer of the armor in field conditions. The BTR-4MV1, while having better armor protection than the BTR-4, adequate armor protection to withstand medium to heavy RPG fire. Gross weight – 24700 kg. The new engineering solution offers a high level of protection for the vehicle’s occupants against improvised explosive devices (IEDs) and mine blasts. 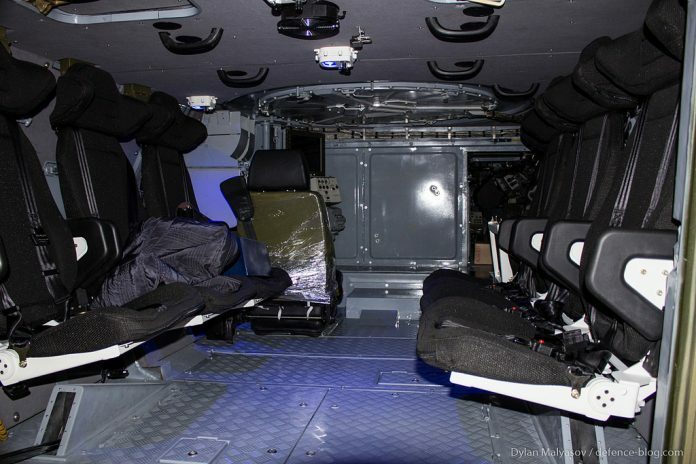 The vehicle has mine-resistant seats and spall liners. The wheeled armoured fighting vehicle has a rear ramp with doors for troop entry and exit. It has a crew of three consisting of the driver, gunner, and commander and hold six troops. The BTR-4MV1 is equipped with a German Deutz engine and the American Alisson transmission. It is capable of sustained speeds of 110 km/h on level roads. According to the company, the vehicle weight 24-25 tons, which is 2-3 tons more than BTR-4. In addition, the BTR-4MB1 retained the possibility of forcing water obstacles by swimming, at speeds up to 10 km/h. The newly modernized BTR-4MV1 version, demonstrated in the framework of the “Arms and Security” exhibition for the first time, also received a new opto-electronic sight with a powerful thermal imager, coupled with a high-precision digital fire control system. A new sight was manufactured by the State Enterprise “Izyum Instrument-Making Plant”, which is the part of the State Concern “UkrOboronProm”. 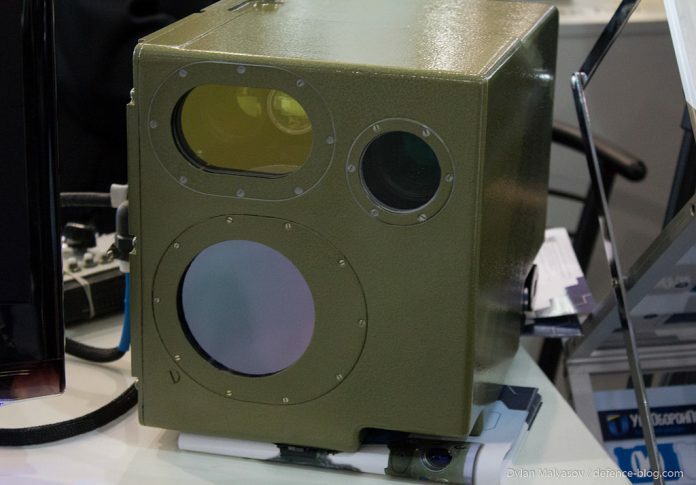 A new high-sensitivity thermal imager, capable of detecting targets at a distance of about 5 km, became the main feature of the new sight OEP-VN. This allows BTR-4MV1 to destroy the enemy at the maximum range of weapons, even in the night and in difficult weather conditions, this significantly expands the combat capabilities of BTR-4MV1. The vehicle can be armed according to customer requirements. After a series of tests, it is possible to adopt in service of the Armed Forces of Ukraine. Also, UkrOboronProm is ready to propose a new BTR-4MV1 wheeled armoured fighting vehicle to foreign customers.